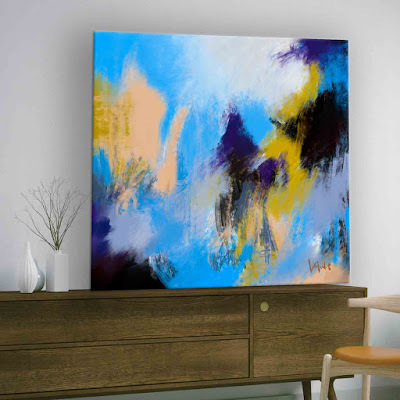 I am releasing many of my abstracts as-Instant Downloadable Art Print Files. That means you can own some affordable art. Several times a month, I will post a new Instant Art File Download that can be printed at home, online or at a local printer. This week, I am releasing Blue Skies for art lovers who would like to save some money and perhaps have art printed on something special like a tapestry for your living room or office. Blue Skies is a 36 x 36 inch JPEG image file that is ready to print at that size. You can also resize it to fit your needs. It's a high quality file that is at 300 DPI or PPI. You can also enlarge it a little more without sacrificing quality. Once you have paid, you'll be directed to the download page where you can download instructions and your art file.